1. Channels: Red LED indicator is for PWM mode. Blue LED for SBUS/PPM, can be extended to 10 channels. 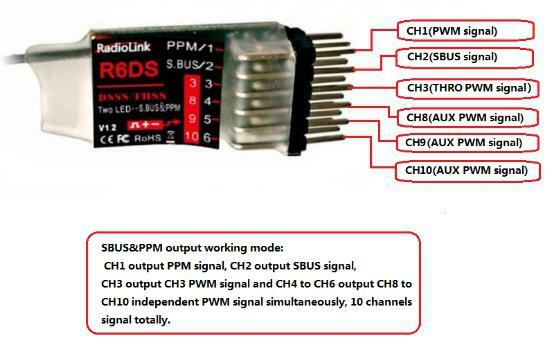 Radiolink R6DS, 2.4G 6 channels receiver, DSSS and FHSS spread spectrum working synchronously, use for Radiolink transmitters AT9, AT9S and AT10. SBUS, PPM and PWM signal possible working at the same time. 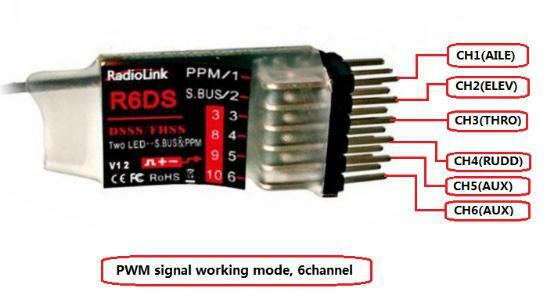 (1) PWM signal output working mode：red LED indicates PWM signal output, 6 channels totally. (2) SBUS/PPM & PWM signal output working mode: blue/purple LED indicates SBUS/PPM signal output, CH1 output PPM signal, and CH2 output SBUS signal, CH3 output CH3 PWM signal(for helicopter) and CH4 to CH6 output CH8 to CH10 independent PWM signal simultaneously, 10 channels signal totally. Short press the ID SET switch two times within 1 second, the signal is changed from normal PWM to SBUS/PPM. The red LED indicates the normal PWM and blue/purple indicates SBUS/PPM. 1.DSSS&FHSS act perfect on anti interference, especially on 433 and graph transmission. 2.Output SBUS, PPM and PWM signals simultaneously. 3.Top speed response, 3ms for all channels parallel. 4.Top precision 4096, 0.25us every bit insure every servo stable. 5.Sub miniature size, totally weights 3.4 grams, never burden to your drones, best choice for light drones. 6.All channels response parallel, totally 3ms. 7.Specially used for light drones, compatible with all flight controllers such as DJI NAZA, ZERO TECH, PIX, APM, MINI APM, NAZE32, and CC3D etc. 1. The antenna must be kept as straight as possible. Otherwise it will reduce the effective range. 2. Large model aircraft may of some metal part interfering signal; in this case the antennas should be placed at both sides of the model. Then the best RF signal condition is obtained at any flying attitude. 3. The antennas must be kept away from conductive materials, such as metal and carbon by at least a half inch. The coaxial part of the antennas does not need to follow these guidelines, but do not bend it in a small radius. 4. Keep the antennas away from the motor, ESC, and other noise sources as much as possible. 5. Press and hold the Easy Link (ID SET) one second, now the receiver starts work. 6. After all of the above steps finished, the LED indicator will turn and keep in red. 7. The receiver can be packed by sponge or foam for shocking proof when it is installed to the model. After all of the above steps finished, turn off the transmitter and then power it on, now the program functions to assure it under control of transmitter with a right connection . 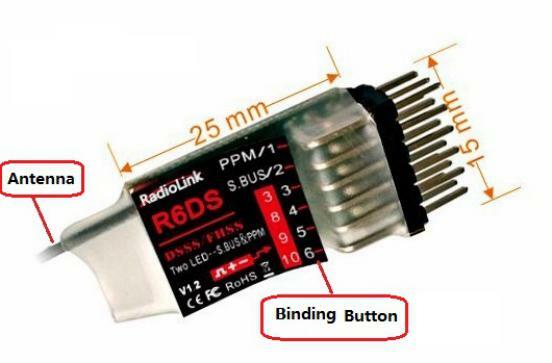 Click the button below to add the Radiolink R6DS 2.4G 6CH PPM PWM SBUS DSSS/FHSS Receiver Compatible AT9 AT9S AT10 AT10II Transmitter (Upgraded R6D) to your wish list.